ALEXANDER HAMILTON. 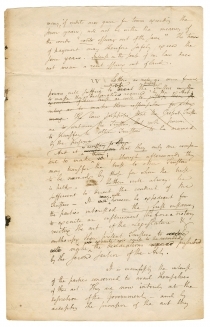 Autograph Manuscript Draft, to Théophile Cazenove, c. May 19, 1796. 2+ pp. The Holland Land Company involved many luminaries of the day, including their attorney Hamilton, Aaron Burr (who paid $5,000 in bribes on behalf of the company), and other prominent buyers, sellers, and investors. In 1792 and 1793, Robert Morris sold 3.25 million acres in western New York to trustees of Amsterdam’s Six Houses. In December 1792 and February 1794, Declaration and Constitution Signer James Wilson sold 1.4 million acres (more than he could deliver) in western Pennsylvania to trustees of the Six Houses. Morris and Wilson, two of the most influential founders, both spent time in debtor’s prison, in part for their land speculations. Though Morris was out of government at the time, Wilson incredibly served short stints in debtor’s prison while he was a sitting Supreme Court Justice. I The security of the persons for whom the lands are held in trust will not be as good as if the lands stood in their own names (with a capacity in them to hold) in this particular, that conveyances by the Trustees without or against their authority or permission to persons who may purchase bona fide, without knowledge of their violating their duty will be valid and effectual. It is not recollected that the security will be worse in any other respect. Heirs wives and creditors of the Trustees cannot affect the lands by their claims. But there will be no difference whatever, after acceding to the act of the Legislature, from what is now the case, as to the power of the Trustees and the rights of third persons. II The persons for whom the lands are held in trust will be in the same situation at the end of the seven years, if they accept the provision of the Act, as they were before it passed, with this single difference, that more precision and notoriety will have been given to the existence and nature of the trust and the Identity of the lands. But this is of little consequence, because it has been long since known that LeRoy and Bayard were Trustees for purchases of this kind, & they might at any time have been compelled by a bill in Chancery to disclose all the particulars of their trust; so as to have enforced the forfeiture for the alienism of those for whom they held. A transfer by the present to other trustees at the end of the seven years will make no difference. III The interest upon purchase <2> money, if credits are given for terms exceeding the seven years, will not be within the meaning of the words “rents issuing out of the same” The times of payment may therefore safely exceed the seven years. Interest in the sense of our law does not mean a rent issuing out of land. In February, 1796, the Six Houses combined to form the Holland Land Company. However, Indian claims and the lack of surveys and roads dashed their hopes to sell quickly; the last of their lands wasn’t sold until 1840. On April 11, 1796, the New York legislature passed a bill allowing those persons who had taken title as trustees to hold them for a period of seven years. The act gave the Dutch owners that period either to become citizens or to sell the property to American citizens. 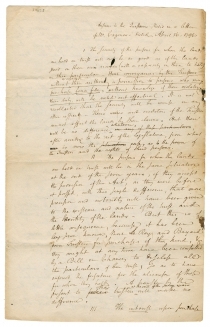 Five days later, on April 16, 1796, Cazenove wrote to New York Supreme Court Justice Egbert Benson asking a series of questions regarding the security of the Company’s lands held by trustees, according to the provisions of the new law. Benson had worked with Hamilton to get the law passed. This document is Hamilton’s retained draft of his May 19 response to Cazenove’s queries to Benson. Théophile Cazenove (1740-1811) was a native of Holland and had a brokerage and commercial business in Amsterdam from 1763-1788. He represented the “Six Houses” (Dutch banking houses) in their American business. He arrived in the United States in 1790 and persuaded the banks to invest in western lands. Between 1792 and 1794, Cazenove purchased more than five million acres in western New York and Pennsylvania for his employers. Both Alexander Hamilton and Aaron Burr advised him on matters of his clients’ land and interests in America. Cazenove’s house in Philadelphia served as a social center for French émigrés who had fled when the French Revolution began turning on itself, and Cazenove served as a key intermediary between the French émigrés and American financial leaders. Herman LeRoy and William Bayard were partners in a New York merchant firm and American citizens, who held land for the Six Houses and then for the Holland Land Company. Law Practice of Alexander Hamilton, 3:619-20. Remainder: “will acquire a security for their interests and operations for seven years. At the end of that time they will be as to the land not then disposed of, substantially in the same condition in which they now are as to the whole. In my judgment there is no room to hesitate.” Law Practice of Alexander Hamilton, 3:697. Harold C. Syrett, ed., The Papers of Alexander Hamilton, vol. 20, January 1796–March 1797 (New York: Columbia University Press, 1974), 346n. Law Practice of Alexander Hamilton, 3:694-97.